Venus is the second planet from the Sun, orbiting it every 224.7 Earth days. It has no moon. The planet is named after the Roman goddess of love and beauty. After the Earth’s Moon, it is the brightest natural object in the night sky, reaching an apparent magnitude of −4.6, bright enough to cast shadows. Because Venus is an inferior planet from Earth, it never appears to venture far from the Sun: its elongation reaches a maximum of 47.8°. Venus reaches its maximum brightness shortly before sunrise or shortly after sunset, for which reason it has been referred to by ancient cultures as the Morning Star or Evening Star. Venus is a terrestrial planet and is sometimes called Earth’s “sister planet” because of their similar size, gravity, and bulk composition (Venus is both the closest planet to Earth and the planet closest in size to Earth). However, it has also been shown to be very different from Earth in other respects. It has the densest atmosphere of the four terrestrial planets, consisting of more than 96% carbon dioxide. The atmospheric pressure at the planet’s surface is 92 times that of Earth’s. 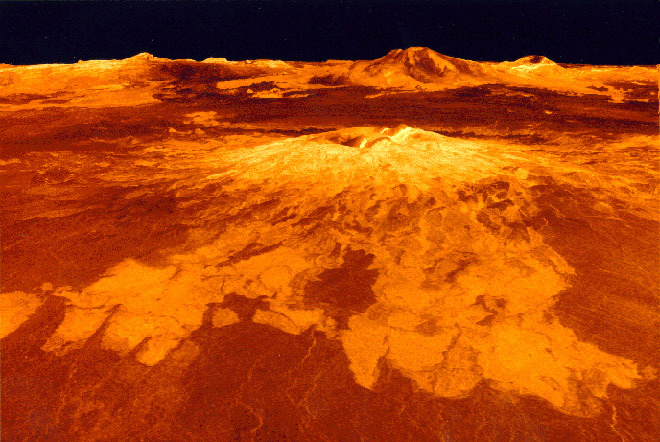 With a mean surface temperature of 735 K (462 °C; 863 °F), Venus is by far the hottest planet in the Solar System. It has no carbon cycle to lock carbon back into rocks and surface features, nor does it seem to have any organic life to absorb it in biomass. Venus is shrouded by an opaque layer of highly reflective clouds of sulfuric acid, preventing its surface from being seen from space in visible light. Venus may have possessed oceans in the past, but these would have vaporized as the temperature rose due to a runaway greenhouse effect. The water has most probably photodissociated, and, because of the lack of a planetary magnetic field, the free hydrogen has been swept into interplanetary space by the solar wind. Venus’s surface is a dry desertscape interspersed with slab-like rocks and periodically refreshed by volcanism.